Happy first week of October #tcdbabes! I hope you all have been having a beautiful week so far and getting yourselves ready for all that October has to offer. Personally, I am so excited and super ready for some cooler weather so I can bust out all of my cute sweaters and begin watching the leaves change color. I am also not opposed to all the pumpkin flavored things either…speaking of which…I still have not made it to Trader Joes yet…I need to get on that haha. 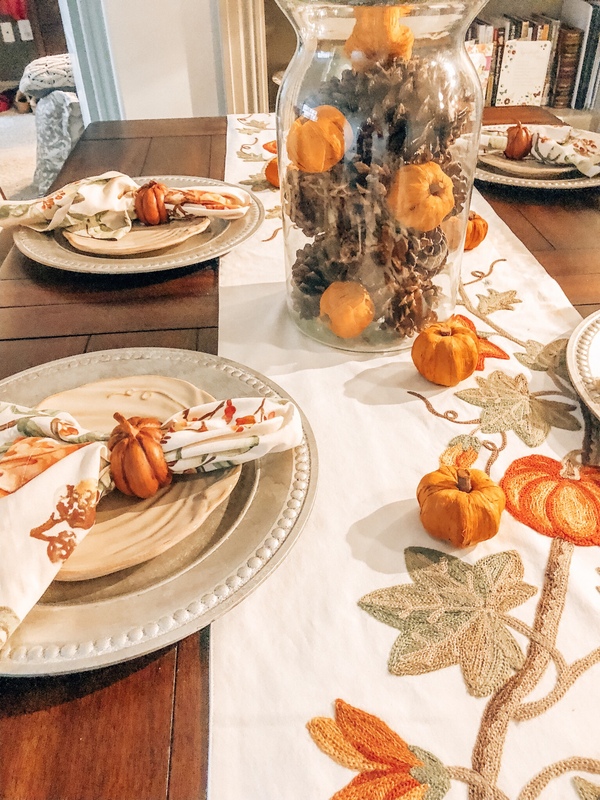 Anyways, fall is honestly my favorite time of the year and I am so happy it is here, which is why I thought I would share with you my favorite thing to decorate for the seasons –> my dining room table. Sadly, I was definitely one of those that decorated my table in September haha. I just couldn’t help it and I love my table decor, so I had to. When it comes to my table, I typically keep the basics simple most of the year and then just switch in and out different things. For example, I only have one set of chargers. I specifically bought neutral ones so that as I was accumulating my decor, I could use them over and over again. The vase in the middle is out all year round, I just switch it around the house and use it for multipurpose. In this case, I filled it with these super cute little pumpkins and some cinnamon pinecones! I have had the mini pumpkins (they are a perfect item to use year over and over because you can change up the way you use them) and got the pinecones from the grocery store. I then added a fall themed table runner which I keep out through Thanksgiving. This was a little bit of a splurge, but it is probably one of my favorite table runners I have. Personally, I think I only have three or four. This one is for fall and Thanksgiving, and then I have one for Christmas, and two to use for Spring and Summer. I don’t think it has to be complicated and for a lot of these items, I recommend checking out Homegoods. They do an excellent job with bringing out so many cute seasonal items and have an excellent price point. For anyone just starting to begin their seasonal collections, I would absolute recommend heading to your local one first. 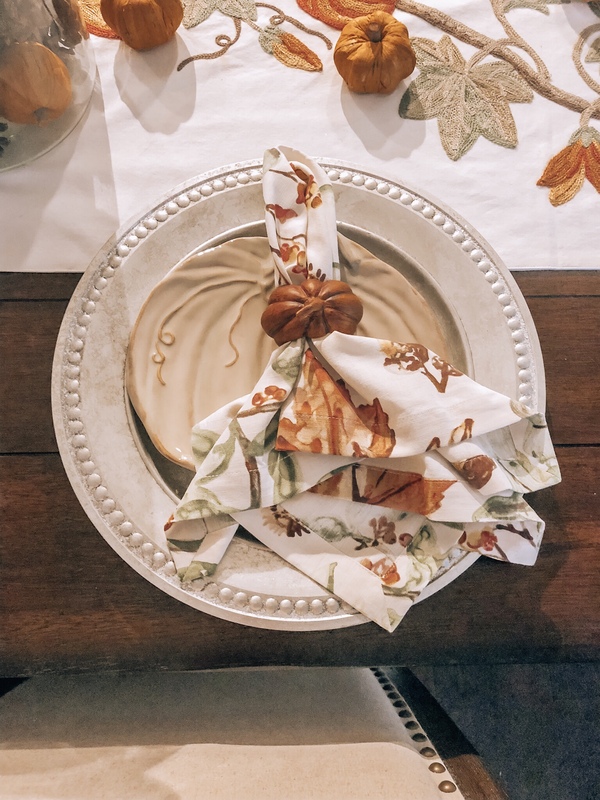 In regards to the setting, I found the plates on sale from Pottery Barn after the season was over for them (they switch over pretty early to Christmas), picked up some napkins and I also splurged on the napkin holders, but to me they are classics. I personally try to keep my table easy. I start with a runner, do my settings first, then decide what I want in the middle because that sort of pulls it all together. None of it needs to be complicated and I always try to repurpose what I already have! 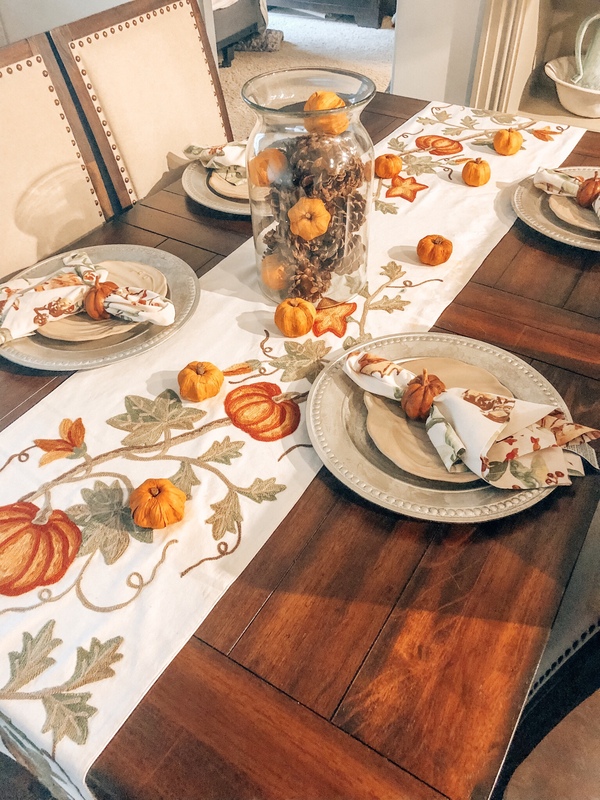 If you do a fall table I would love to see!